There's no way around it. Relationships are intimate, messy, fulfilling, frustrating...and God put inside each one of us the need to be surrounded by them. We firmly believe that we can't become dedicated followers of Jesus unless we're connected with people who share their lives with us and who we can share our lives with. We believe that happens best in Life Groups. Sometimes, finding your place in a large church like The Creek can be a little intimidating. 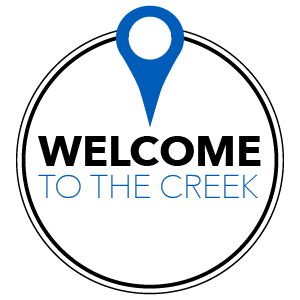 At Welcome To The Creek, you’ll learn who The Creek is, get to know some of our staff and leaders, and learn about our different ministry areas—all in just a little over an hour. Make an appointment for your Welcome To The Creek session. You will leave the class or appointment knowing that you are welcome here and that there is a place for you. Rooted is a 10-week discipleship journey designed to launch you into a Life Group. You’ll join in conversations and interactive experiences with a group of 12-16 people that will help you connect to God, the church, and your purpose. Looking for a Life Group? You've come to the right place. To be part of a transforming community, we have to be in relationship with others. No way around it. It’s how God created us. It’s how we serve and make each other better. It’s also how God wired us to be made more like Jesus. Discipleship is not an individual sport; you’ve got to be part of a team. Offered three times a month, it's where you can learn how we connect with each other and how ministry happens at The Creek. Rooted is a 10-week discipleship journey designed to launch you into a Life Group. You’ll join in conversations and interactive experiences with a group of 12-16 people that will help you connect to God, the church, and your purpose. Learn more about the Gospel and salvation at this class that meets once a month. Click on the registration options to review dates of upcoming classes. This Baptism class is open to adults and students, Grade 6 or higher. If you are the parent of a student in grade 3–5, please email Chad Koke ( chadkoke@thecreek.org) for next steps regarding Baptism. If you are the parent of a student in grade K–2, please email Alison Hankins ( alisonhankins@thecreek.org) for next steps regarding Baptism.